The following video (🎥 3 min.) is an incomplete compendium of all the changes and tactical evolutions through his almost 10 years as a First Team Coach. The nickname that he gave to himself (“a stealer of ideas”) doesn´t prevent from valuing him as what he really is: A solid example of someone that fosters innovation using a fantastic balance of intuition and reason. Immersed in a time dominated by teams that played 4-4-2 (with width provided in midfield), in 2008 he recovered the 4-3-3 as a starting point (footnote: it is fair to say that Rijkaard had been using it already at Barcelona). The news is not the use of system itself, but the “why”. By providing width with the wingers (a very basic concept nowadays), Barcelona was able to dominate the center of the field (the most importante zone for Guardiola) with Touré, Xavi, Iniesta and (afterwards) Messi. The width provided by wingers would allow the team to keep the whole first defensive line far away, giving space for the rest of the team to progress with the ball taking advantage of the numerical dominance. Many times has Guardiola explained the specific moment when he decided to start using Messi as “false 9” (v Real Madrid, in May 2009). ¿Is the false 9 a concept invented by Guardiola? Not at all. But it is an extremely clear example of willingness to innovate and change when needed. Given the historical victory (6-2 v Real Madrid), that concept is now universal. Messi as False 9. If the centre back doesn´t follow him, he receives with no mark and oriented towards the opponent´s goal. Messi as False 9. If the centre back does follow him, space is created on his back and will be seized by one of the wingers. “The goal of the Juego de Posición is not to move the ball, but rather to move the opponent”. 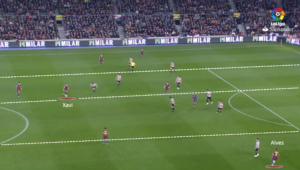 This Principle fits perfectly with a clear offensive pattern seen in Pep´s teams (which was exploited afterwards by Luis Enrique´s Barcelona): To generate contexts so that one of the players (normally Xavi or Dani Alves) could cross the ball from one of the Half-Spaces to the opposite one (with another player cutting through). In Bayern Munich, Guardiola changed the offensive movements of Lahm and Alaba (historically traditional full-backs), making them run into the Half-Spaces. What did Guardiola think they would achieve? On one hand, they would provide wingers with more space to play 1v1 (as less players would be occupying the wings); on the other hand, Bayern would be way more prepared for the gegenpressing (pressing immediately after losing the ball) as more players would be closer to the most difficult zones (e.g. those with higher likelihood of being the ones where the loss happened). With that in mind, they would be able to neutralize one of the most powerful weapons by most of the Bundesliga teams: the counterattack. By moving the full-backs to the Half-Spaces, Guardiola would achieve two things: (1) Generate appropriate contexts to play 1v1 with wingers; (2) Occupy the centre space with enough players so as to prevent counterattacks. Douglas Costa, the strength of the weak side. Douglas Costa´s arrival to Munich brought a breath of fresh air to Guardiola. The Brazilian is a specialist in 1v1s. But that was not something new in Bavaria (as Robben and Ribbery do have this ability). Instead, his talent for constantly looking to finalize is what is remarkable. Unlike Robben, Douglas Costa tries to finish everything he touches: Each single play ends in a cross, a shot or a corner kick. Furthermore, he can dribble on and to any side. In this sense, it can be said that Bayern turned into a more German team when it comes to the final third, sacrificing possession towards more speed. Overload to isolate, to allow Douglas Costa play 1v1, was a clear offensive pattern seen in Guardiola´s last year at Bayern. There haven´t been that many clear changes in his first season at Manchester City. More precisely, his changes haven´t had the exact returns he has been looking for. However, it is clear that he has kept all the General Principles of the Juego de Posición, even in such a special League as the Premier (more known for others styles of play). 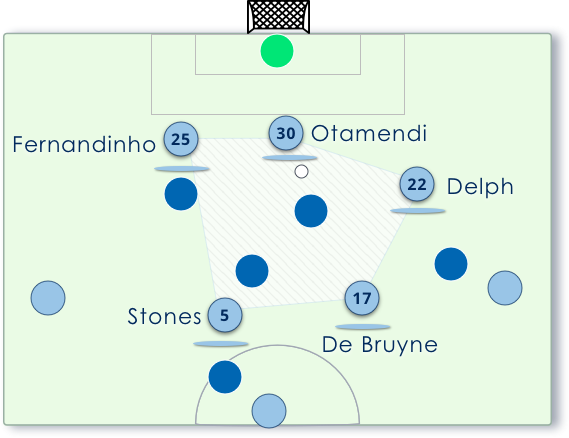 In his first match, for example, a clear WM was seen, with Clichy and Sagna moving to the inside lanes already in build-up situations, allowing Sterling and Nolito to create passing lanes and receive right away. Guardiola showed clear willingness to innovate and change right from the beginning at Manchester City. In this case, Sagna and Clichy (full-backs) would move to the Half-Spaces to create a WM shape. In his second season, as of December 2017 Guardiola has achieved 14 consecutive wins in the Premier League, a historic record. One of the most significant improvements has to do with more positional fluidity: Often times can be seen that players occupy the space that the game demands and not necessarily what their official position says. Changing roles between or within games is normal, and everything is in favor of solving the problems that arise at those precise times. Games Principles are the starting point, and not fixed positions. This phenomenon can be seen mostly during build-up phase. The classic Salida Lavolpiana assumes that CBs should provide appropriate width and defensive mid should situate between them. At Manchester City, this can happen as well as not, and it only occurs as long as it provides solutions during that game. In this 2017/18 version of Manchester City, Game Principles are above fixed positions. Often times can be seen that the same players occupies different spaces according to what the game demands.